Our Sports Combo Bounce House provides hours of fun as your kids will jump in the large jumping surface, slide down the fun slide and shoot hoops in a built in basketball hoop! This bounce house is 16 feet wide by 21 feet deep and is 15 feet high. One attended is required to monitor play while children are playing. This attendant can be someone that you provide, or Parties Inc. can provide an attendant at an additonal cost. 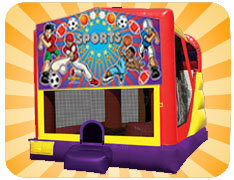 This bounce house can be set up on grass, a drive way, school black top, or inside a gym. A set up area of 24 feet wide by 22 feet deep by 10 feet high is required. A regular 15 amp circuit is equired with nothing else running on it. Normally, your back yard outlet will work fine! The bounce house must be plugged into the power source at all times during operation. For instances where power is not available, we have generators available for rental. Set up in a park requires permission from the park. A copy of the permit that shows approval of the bounce house needs to be provided at the time of reservation. Set up on a street requires a permit from the city and for the street to be completely shut down with city provided barricades. No cars can move within the set up area the lengh of time the bounce house is set up..